Keith P Rein is a professional artist & graphic designer currently residing in Fort Collins. He studied photography, illustration, + design in Athens, Ga, culminating in an illustration style that touches upon photorealism, pop art, and comic art. 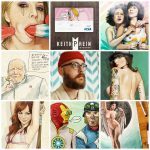 By blending the analogue techniques of watercolor with the modern teachings of digital painting, Keith is able to produce an aesthetic that is simultaneously whimsical and titillating. His graphic design and illustration for Second Self Beer Co.’s Manic Pixie Dream won Second Place in USA Today’s Best Beer Labels of 2018. More of his graphic work can be found under his design studio Salt & Paper. Keith has worked with Second Self Beer, Music City Hot Chicken, Cochon NOLA, & others.